A safari adventure presents the ultimate packing challenge. A trip to Africa is a big investment in time and money. Long overseas flights, short flights on bush planes, and no convenience stores in the bush. All clothing, gear, and essentials must fit into what’s basically a carry-on bag. And as a wildlife safari is a lifetime dream for photographers and videographers, you won’t want to leave your best gear behind. Each traveler is allowed a maximum or 44 lbs (including camera equipment and personal items) in a soft sided bag. For most of us that means we bring the bare minimum of clothing, mixing and matching as we go, and relying on laundry during the trip. Fortunately, most safari camps offer laundry services so you can count on some help here. See Packing for Safari for clothing suggestions. Duffel: No hard-sided or wheeled luggage allowed! NOTE: we do not own an Aeronaut bag but base our recommendation on friends who have traveled with the bag. This choice is determined by what you carry. Remember that your camera equipment counts towards your total allowed weight. For Professional Photographers (or amateurs carrying professional equipment) – Choose a backpack designed especially for your equipment. Dave carries a Canon backpack or Lowepro slingback which allow easy access to his cameras and lenses. For general photographers – a small camera case – slingback or hipbelt – works well. But consider using camera inserts or wraps within a normal pack or tote. This minimizes packing space and is also good in that it doesn’t advertise the expensive equipment you’re carrying. I recommend the Tom Bihn packing cube shoulder bag – right – as I can use it for an seat-back flight bag, but re-purpose it for as a camera bag at my destination. Dave is carrying his Canon Rebel T3i dSLR. For this trip he has decided to rent a high end Canon EF lens. These lenses are often available to rent in Africa but he will rent here so as to have time to adjust to the lens. He’ll also bring a couple of prime lenses. In 2014 I purchased the Panasonic Lumix FZ200, a superzoom with Zeiss lens, for its low light capabilities and long range. I loved having a high-quality point and shoot so I could savor my time in the field without concern for lens changes. I debated upgrading the camera for the second safari, but decided that the quality of the FZ200 in relation to its weight was too good to trade. Binoculars – One set is sufficient for a couple traveling. We maximize quality in a small package with the Swarovski CL Companion line. The optics are astonishing for such a small, lightweight binoculars. Smartphones – phone cameras have improved tremendously since 2014. I wouldn’t recommend using one as your only camera but a smartphone camera will come in handy for quick shots around camp. iPad mini 64 GB – At .73 lbs it’s a lightweight solution an entertainment device on flights and portable backup device for photos. Load the new, waterproof Kindle Paperwhite with books from your library’s Overdrive collection. External charger – most camps have charging stations and most airplane seats have outlets, but don’t count on it! Bring a small lipstick Anker (3 oz.) charger or, my favorite, the Anker PowerCore 10000 (6.3 oz). Flashlight or headlamp – each traveler should carry their own flashlight or headlamp. We bought the UCO flashlight/lantern combination in 2014 and were glad we did when an elephant broke through the electricity lines in camp looking for jackal berries… In the 5 years since, this light is always by my bedside in case of power outages. Packing for Safari – free packing list! TravelingTulls is a participant in the Amazon Services LLC Associates Program, an affiliate advertising program designed to provide a means for sites to earn advertising fees by advertising and linking to Amazon.com. We are not provided with any products by Amazon but receive a small fee if you purchase an item through our link. No products have been provided to TravelingTulls by the other merchants reviewed above. 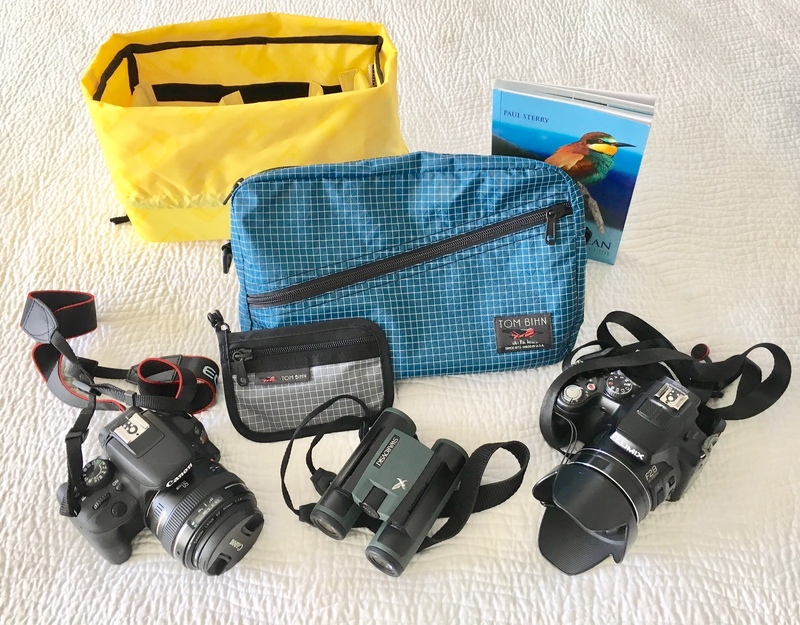 Posted on February 3, 2019 April 19, 2019 by TravelingTullsPosted in Africa, Gear and Gadgets, Journey African Safari, Pack for AdventureTagged binoculars, camera equipment, cameras, Eagle Creek, osprey packs, packing light, tom bihn.